Bharat Sanchar Nigam Limited (BSNL) has launched SMS based fault booking facility for its landline and broadband customers in all telecom circles. Earlier SMS based services are available only from BSNL Mobile numbers on SMS short code 53334. Now, these services are also available from mobile numbers of other operators on SMS long code 94780 53334. Landline Fault Booking, Broadband falut Booking, Bill Enquiry, Registration of Mobile Number or Email ID, Registration for Email Bill Facility etc are available through SMS. To get details or to register complaint, customers may send the required Keyword in correct format to 53334 (from BSNL mobile numbers) or 94780 53334 (from non-BSNL mobile numbers). For broadband fault booking the syntax is BFT<space><STD Code-Tel No> (e.g. BFT 0471-2654321) while as for landline fault booking the syntax is FLT<space><STD Code-Tel No> (e.g. FLT 0471-2654321). For bill enquiry the syntax is BILL<space><STD Code-Tel No><space><Billing Account No> (e.g. BILL 0471-2654321 9010203040). The system will send the acknowledgement of the SMS received from the customers and this acknowledgement will also have the fault booking reference number for further follow-up. 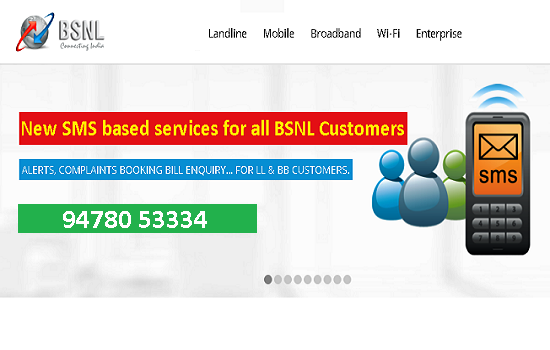 Dear readers, please share your views and opinions about this new service launched by BSNL via comments with us.